"Mum! I twisted my ankle when I was playing the basketball"! A sports enthusiast said. "Cold weather plays the devil with my rheumatism". Tom's grandmother said. As time goes by, many people is getting more and more attentions on their health. Teenagers and adults love outdoor exercises during their spare time. They go running, climbing, play basketball, mountain biking adventures and so on. Following strenuous exercises, we realized we need some compression accessories in case of people's joints hurting. During to open up the compression accessories market, we also find out some elderly people also need to protect their joints with their rheumatism problems. ♥It focuses on breath-ability and durability necessary for an athlete. 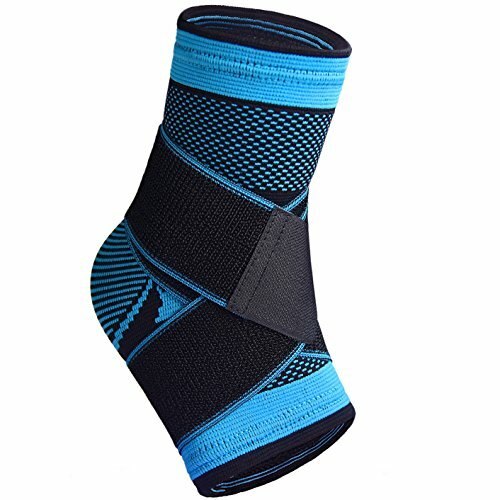 ♥The extremely light Sports Ankle Support features an innovative taping strap which supports the ligaments and helps protect your ankle against sprains and twisting. ♥Our Inflammation Reduction Technology teams up with compression to improve blood circulation,and relieve the effects of plantar fasciitis, varicose veins,and more. ♥Machine washable. Make sure the sticky part of the Velcro is covered or it sticks and snags everything it touches. STRONG SUPPORT -- Ankle support fitted with crisscross reinforcement straps to offer strong support & stabilization for the ankle tendons and joints.Designed to minimize the risk of injury especially during the strenuous activities. SOFT AND COMFORTABLE -- Made of breathable high-elastic and moisture wicking material which increases blood circulation and provides soothing warmth, aids in reducing injury recovery time. VERSATILE -- Ankle supports are the perfect fit for any activity requiring ankle movement without constricting it & restraining your movements. Ideal for Running,Basketball,Soccer,Hiking and more! SATISFACTION GUARANTEE -- We also offer you 100% risk-free satisfaction guarantee to let you buy with confidence.If you have any issue to return the product, please contact us. If you have any questions about this product by U-picks, contact us by completing and submitting the form below. If you are looking for a specif part number, please include it with your message.